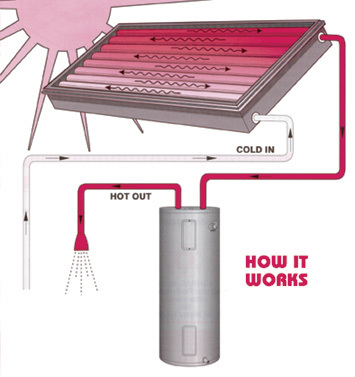 The ProgressivTube® passive solar water heater is a self-contained unit that acts as a solar collector and storage tank integrated into one piece of equipment. In most systems the unit is utilized as a pre-heater to a terminal, instantaneous or conventional water heater. The ProgressivTube is a passive system because it has no moving parts and operates on local water pressure and solar radiation. There are no pumps or controls to maintain and no electrical energy is required to make it function. Once installed the system will operate automatically. When hot water is used in the household, solar preheated water is drawn into the conventional water heater, reducing or eliminating electricity or gas usage for heating water. However, as with all solar water heaters, the total amount of solar contribution to the system is dependent upon the hot water consumption pattern of the household, daily weather conditions, and variable amounts of available sunlight throughout the year. The all copper collector/storage tank of a ProgressivTube unit absorbs solar radiation through its selective surface coating which raises the temperature of the water stored in the collector. It is well insulated with closed cell foam and the unit is double-glazed for increased heat retention. The 4" diameter copper tubes are welded into a series flow pattern so that the top of the lower tube feeds the bottom of the next tube. This allows the ProgressivTube unit to contain the colder replacement water in the lower tubes where it is heated by the sun as it flows from one tube to the next. Each time hot water is used, the ProgressivTube's innovative design eliminates the cooling down of the remaining heated water that normally occurs in other types of solar water heating systems. Not only does this design ensure the delivery of the hottest water, but it also provides more hot water at a higher temperature and with a faster recovery time than solar systems of similar capacity. GLAZING GASKETS: A continuous gasket made of special long life EPDM synthetic rubber is compressed by the glazing caps to seal out the weather. The inner glazing spline is made of high-temperature tolerant EPDM. GLAZING: Outer glazing is tempered low-iron solar glass with 91% transmittance. Inner glazing is Teflon? film, known for its high temperature tolerance (525?F) and its long term durability and stability, transmittance 96%. The 3/4" air space between glazings reduces heat loss. FLUID CONNECTIONS: Inlet and outlet connections are made of nominal 3/4" diameter Type "L" hard copper pipes. This allows for fast, leak-free sweat fitting plumbing connections. CASE: The baked-on bronze acrylic finish of the hard temper, T6, extruded aluminum framewall and glazing caps, alloy 6061, assures years of attractive rust-free appearance. All rivets and bolts are aluminum or stainless steel. Aluminum back sheet .025". INSULATION: Rigid closed cell polyisocyanurate foam board, the most efficient insulation available, is used to maximize heat retention. Sides and ends of the unit have 1.5" board, R-value 10; bottom has 2" board, R-value 14; between tank tubes has 1.5" board, R-value 10. ABSORBER/STORAGE TANK: Constructed entirely of copper, the 4" diameter tubes are welded to the interconnecting pipes to form a series flow pattern. The tank is pressure rated to 300 psi and is coated with a high-temperature "selective" solar radiation absorption surface that maximizes heat gain and reduces heat loss. Manufactured by Thermal Conversions Technology. Distributed by Gull Industries.